A mother takes the law into her own hands and gets a confession out of a criminal. A building somehow becomes engulfed in flames and spreads to other building in the town. After seeing a beautiful woman across the room Paladin over hears Hey Boy tell her that there where no more Opera Tickets for that nights show. Paladin being the gentleman he is offers to accompany her, it ends up being a night like no other. Man gets swindled at cards and looses everything he has to a crooked dealer and ends up being accused of Murder. A crooked banker and sheriff team up to take money from unsuspecting hard working men. The Brugan brothers rob the Osage Bank, two old prospectors (Sleepy and Missouri) think their silver mine is dried up. With the help of Tonto and the Lone Ranger they may get back to providing for themselves. Please take our listener survey so we can see who our audiance is. 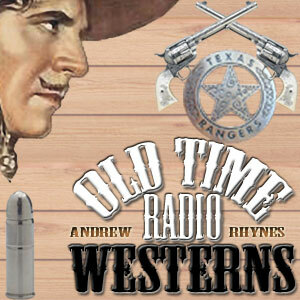 So this is what I have made for the Old Time Radio Westerns Podcast. Hope you like it. Welcome to our new Podcast Site. We will have something up soon, but this site/podcast will be a dedication to thew Old Time Radio Westerns with a Daily show featuring some of the best Westerns out there.